Erika stayed on Dreamagic last night so we had a breakfast of fruit before wandering down for a final coffee with Chris. 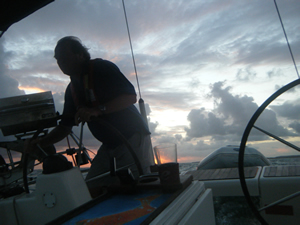 At about 9am we untied and motored out towards Manly, 50 miles away. 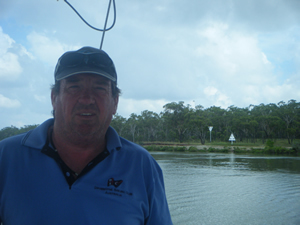 The sea was slight, the wind finally came from the east and we motor sailed through the channels and sandbars that make up the northern part of Moreton Bay. We are experiencing very low tides at the moment and the marina office had warned us that we may have difficulties but we located our allocated berth and put her away without too much difficulty. The bar seeemd like a logical place to finish the journey, and Jimmy Doherty, the magical leprichaun seemed like the logical person to join us. I have known Jimmy for at least 20 years, we were both new yachties in those days. Now he has done dozens of Hobarts, two handed Osaka races, single handed yacht deliveries and whatever else is dangerous and wet. Always great for a story we sat at the bar and swapped tales. It seems funny to be back. Like a lot of these things, the planning, the execution, the problems, the good times, and now that it's all over it's an anti climax really. I feel a bit lost. Was that it? Well, I hope you enjoyed the trip. I certainly enjoyed having you aboard. 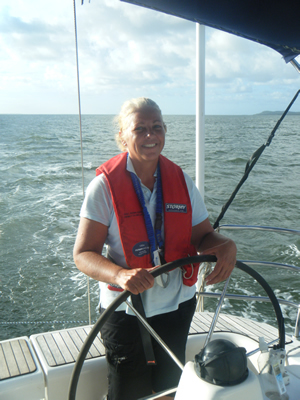 If you can get near Brisbane and fancy a sail just get in touch via this website. Meanwhile...until next time! We plan to leave here for Brisbane tomorrow so today is a layday. Rona had some work to attend to but mid morning we wandered into town. Lunch was at the surf club followed by a surf. We have decided to come back here for Easter after watching the start of the Brisbane to Gladstone so we also booked berths for Time Lord and Dreamagic for the holiday. A phone call from the marina office requested we move because a 24 metre Police Launch wanted the berth we were on. Always willing to help the boys in blue we vacated our berth and after much huffing and puffing managed to get her relocated. Rona's mother Erica visited in the evening with her friend Zeta. Jannelle Suffern also dropped by and with Chris and Graham, boat owners from the marina, the party was in full swing when the Police arrived. Very grateful that we had moved for them, they showed us around their boat. Rona got to sit in the command seat and play with the various knobs and switches. Eventually the girls ran out of questions, the Police went into town to have a few beers and we fired up the BBQ for steak. Chris had suggested a swim in the surf before breakfast so at 06.45 we strolled into town to do that. The day before we had enjoyed coffee at a tiny “hole in the wall’ place on the beachfront. The young fellow who owned it really worked hard and was justifiably proud of his coffees. He had explained that the Ethiopian blend he was offering, while good was still slightly sweet but he was working on getting that out of it. As a tea drinker it is all mumbo jumbo to a Philistine like me but he was earnest and Chris, who has actually attended a barista course recommended it. The coffee was good yesterday, but we had been in a hurry. This time we had time to savour the coffee, and the décor which was upturned milk crates with wooden tops for tables and wooden box like ply structures for chairs. He had been open six weeks, and the place was packed. This is especially gratifying given the literally hundreds of cafes along the front here. He only served coffee, although he had branched out a couple of days before into fruit toast. A daring move, but as his focus was the espresso machine, he sold the slice of bread, and the patron had to put it in the toaster themselves. Brilliant! Two cups of coffee each later and the swim was not looking nearly so appealing. Postponed, Chris went back to potter on his boat, and I went looking for a haircut. A simple task you might think, but it appears not in Moololaba. I walked the streets for more than two hours looking for a Men's Barber. Ladies Hair stylist? Thousands of them. Wax and polish? No problem. Skin rejuvenation? Spray tans? Moololaba is one huge metropolis of coffee shops and pampering parlours. However, for feral yachties who just want a hair cut life is not so easy. I had given up. My feet were aching, the sun was too hot, and I had walked up and down every street in Mooloolaba so many times that the local shop keepers were looking at me as if I were up to no good. Our barista from this morning had waived at me three times now looked away as I trudged dejectedly past a fourth time when suddenly I saw a red and white banner. Tucked away down an alley, invisible to all but the dedicated seeker was a sign that said “Barber”. Feeling like David Attenborough finally discovering the considered extinct Greater Breasted Booby, I cautiously approached. Indeed it was the elusive “Barber”. And it was shut. A sign on the door said “Back in 15 minutes”. Some hope perhaps but 15 minutes from when? I chose one of the cafes that flanked The Barber and having purchased far inferior coffee to that which my new palate was now accustomed, I staked out my hide and waited for The Barber to appear. The wait seemed eternal but was probably no longer tha ten minutes when a young girl who I though was just another member of the passing tourist throng suddenly left the promenade, and producing a key from some hidden pocket in her clothes, placed it in the lock, opened the door and was inside with the door closed behind her. It happened so fast that had I not been watching closely I would have missed it. However I quickly crossed the few feet between my table and the door to The Barbers saloon and, trying to alarm The Barber, slipped inside. Indeed what a Barbers shop rewarded me! There were mirrors, chairs, scissors, razors, clippers. All the accoutrements of a genuine Barber. The Barber looked shocked to find someone here but I had come so far I was not being denied now. I sat in the chair and said in a voice which sounded more confident that I felt, “Can you cut my hair please? Now?” The Barber, realising I meant her no harm, smiled and in a Kiwi accent said she would give it a go. Thirty minutes later and $20 dollars lighter I left The Barbers and walked back to the marina. Of course I passed another Barber on the way, equally well concealed down an alleyway but I didn’t care. I had found a Mens Barber, I had accomplished my mission and surely an invitation to join the National Geographical Society would follow in the mail. Rona returned from her business about 4.30. Debbie, and old friend of mine who now lives on the Sunshine Coast brought her family down to the boat. Last time I saw her daughter Juliet she was about 3. She and her brother are now about 8 years older and the pair were a real credit to Deb. We enjoyed prawns and wine on Dreamagic before visiting the local Pizza place for dinner. I met Debbie when she owned the Pizza Palace in Yorkeys Knob so we had taken our own resident pizza gourmet with us. The meal certainly wasn't up to the standard set in thosedays at Yorkeys Knob, but we had a very pleasant evening wandering down Amnesia Lane. After all this bashing to windward we are only one day away from Brisbane but Rona has to get back to Brisbane so our plan is for her to drive down and Dreamagic will stay here until Saturday. Chris has a car here which he has kindly lent her so after a superb breakfast in town Rona headed off and Chris and I caught up with news and future projects. Chris owns Time Lord, a Bavaria 50 which is like our 44 but on steroids. He initially wrote to me after an article I had published in the Cruising Helmsman and we first caught up at Magnetic Island Race Week in 2010. Since then we have been in touch often. He has now brought Time Lord up from Victoria and is currently based in South East Queensland. 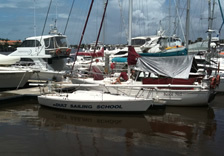 We looked at the 2011 race calendar and he’ll probably bring his boat to join us at Airlie and Maggie Race Weeks. For Easter we are both thinking of watching the start of the Brisbane to Gladstone from our respective boats, and following the fleet up to Mooloolaba to spend the rest of that holiday here. It looks like being a great Winter. 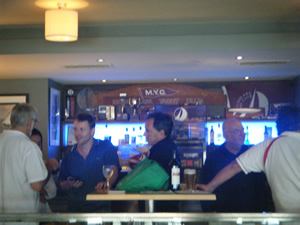 About 4.00pm Chris and I dropped into the local pub where the Mooloolaba Yacht Club now meets. In a strangely parallel situation to Cairns yacht club, they lost their club house but their club is going from strength to strength. The pub supports the club and they have a part of the bar with their memorabilia displayed. Their club J24 is also liveried with “Adult Sailing Lessons” so the public are very encouraged to join in. They had just finished WAGS and we chatted with them for a while before having dinner at the Mooloolaba Surf Club. A very friendly bunch of guys who really promoted their club. Chris, who isn't a member of any yacht Club decided to join! Mooloolaba Surf Club is not unlike Hervey Bay Boat Club, but for young people. The place was packed. The food was great and plentiful, the wine list was extensive and reasonably priced. Mooloolaba has been well planned and the beach is floodlit. There are free BBQ’s along the foreshore and the local population were out in force enjoying the evening. A truly beautiful place to be. We got up at 5.00 and moved Dreamagic to the fuel wharf. I mentioned before that this is a particularly difficult wharf to get alongside, but then every wharf in this bloody marina has been designed to be difficult to get to. This one, which one would think would be busy is tucked away at the wrong end of the fingers in the middle of berths coming out from all angles. Add that it is cleverly designed so a cross wind is always taking the bow off, and the piles which have been thoughtfully put OUTSIDE the floating dock and if the next nearest fuel wasn’t 100 miles away the could keep it! We finally filled and were pleased to be underway. This leg will be big as we have a 50 mile track down the inside of the Great Sandy Straights, across the Wide Bay Bar, and 45 miles outside to Mooloolaba. Easy! Regardless of what CMAP thinks, we hit the bank on the left. The Great Sandy Straights proved to be difficult and we ran aground several times before realising that the red and green marks were obviously put there by a colour blind Stink Boat owner who hates yachts. Some marks were at the extremities of the sandbar they were protecting, some were more like the pin on a golf green, somewhere near the middle, and some had no bearing whatsoever to the course that we tried to steer. Very often when grounding there was no clue as to where deep water may lie and the ability to dredge using Dreamagics reversible prop was all that stopped us still being there now. CMap proved to be useless. The attached image shows where CMap thinks we went. We actually grounded on the bank to the left. CMap also shows us going over a shoal which we actually left to starboard. None the less, in the absence of anything else it was something to watch. It was during one of my “wherethef@karewe” trips below I happened to glance at the Battman which tells me what my batteries are doing. They were doing 17 volts!!! Engine shut down we called our Electrics Guy who helpfully said “I don’t know”. He suggested that we pull a wire off, which we did. The batteries went down to a more realistic figure but as the day progressed showed no sign of going back up. Despite now two alternators, the batteries are still not charging! Finally I pulled the Next Step regulator off the back of the alternator and put the original one back. The batteries did recover to 12.6 volts so we were safe from one problem, for now. We finally got to the Wide Bay Bar late afternoon. We had called the Coast Guard, and an extremely precise English fellow asked us our ETA, and could we call him at Waypoint 3. Rodger! 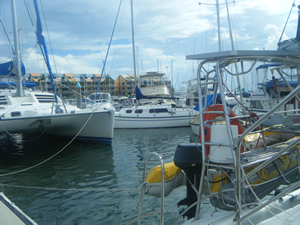 The sailing catamaran “Phlat Chat” called soon after wanting the waypoints. The Coastguard replied that they hadn’t changed since 2001, did they still want them? Yes, so he, in my mind reluctantly gave them. Then Phlat Chat wanted the tide times. “Where” was the Coast Guards reply. Well obviously not at London Docks! Maybe Wide Bay Bar? He gave those too but it was like asking for his PIN number. We got to Waypoint 3 at 17.45 and called him as requested. “This station closes at 18.00” was Rodneys haughty reply. (I have no idea if his name was Rodney, but he sounded like one). “OK, Coast Guard, we’ll stay with you until half way across and then Out”. The sarcasm was lost on Rodney. “Message noted,this is Coast Guard Tin Can Bay standing by until 18.00”. Presumably unless someone puts the kettle on. All was going well until waypoint 2 when things started to get hairy. The sea was steeping and breaking on our side. I could not turn Dreamagic into the waves without losing our course which is critical through the bar with breakers on either side. However at Waypoint 1 the hairy became scary. The waves were at least three metres and many flooded the deck. More the problem was how close together they were. it was like a steeplechase. Dreamagic felt she was going up in a lift, just to vertically drop down the other side, with the next one hitting us before she had a chance to get her bow up. Of more concern to me was the depth sounder which Rona could not see. Despite these massive waves at times there was less than 4 metres under us and if we ran aground here the boat would be broken in two by the next wave. A very concerning 30 minutes followed while we battled these monsters before finally the sounder started to recover and the sea flatten. We had made in through! 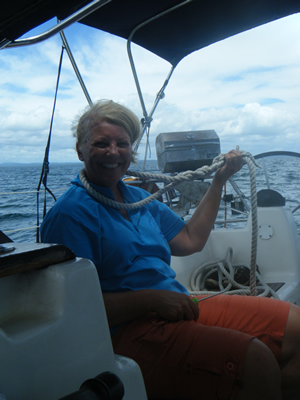 We had taken the precaution of clearing the decks, stowing everything and donning life jackets and tethers. These proved very wise in the end and we kept the jackets on for the rest of the trip. The sea was still lumpy as we beat past the Point Danger light but by 20.00 the moon, which was only one day past full, lit the ocean in a silvery glow. We turned the corner and pointed Dreamagic at Mooloolaba some 45 NMS away. The wind obliged for once to blow at about 40 degrees to our bow so we pulled out some headsail and were doing between 7.5 and 8 knots towards our destination. This was the best night sail I have had since Cairns last year. We had arranged to meet a friend of our, Chris Waldron at Mooloolaba. Admittedly we were currently 2 weeks late but when we called him he told us he had secured a berth next to his Bavaria 50 at the Wharf Mooloolaba and if we would like to call him when we arrived he would catch our lines. We pointed out that it would be about 3.30am but he insisted. Sure enough, when Dreamagic came in, he was on the end of the dock torch ready to give us a hand. Thanks Chris! We didn't even put the boat away but fell into bed. exhausted. Rona will get to her meetings today, just can she keep her eyes open? Shaken from yesterdays glimpse at my future, I wanted to get out of here asap. Unfortunately Dreamagic has other ideas. We got up at 5.00am to pouring rain and a poor forecast. Yesterday I believed that we could just go and fix our alternator problems in Mooloolaba. Rona gets to her meetings, I get something to do fixing it while waiting for her. In theory the engine, once started does not require electricity to keep going. SO, it doesn’t matter if the batteries go flat. At Mooloolaba we just plug back into shore power and all is good. In the cold light of today a couple of things occurred to me. Firstly, what if I am wrong and this diesel does need electricity? We are left drifting off the coast somewhere with no radio, no instruments, no lights and no motor. I took the cover off the battery compartment and replaced the connections that were damaged in the last fire before calling an electrician to come and have a look. Fortunately we found one who could come down and within half an hour had diagnosed the problem. The alternator that we put in last week had some insulating shims put between the main “out” cable and the alternator body. The alternator was working fine in small bursts but when we ran it for 20 hours non stop, it couldn’t get the charge out, got hot, and gave up. So we need another new alternator, which the electrician says he had. Another few hundred, and another delay. I can believe that BOAT is an acronym for Bring Out Another Thousand. The elecrtician finished the alterrnator at about 2.00pm, too late to get away today. We decided to cut our now considerable losses and have lunch at the club. Hervey Bay Boat Club certainly understands their target market. A roast dinner is $10 for a small plate, $12 for a large one. The seniors were queuing about 20 minites before the restaurant opeened and it was a scrum to get to the window tables. Tea and coffee are free so while one half of the pack swarmed towards the choice seats, the other half had the urns covered so that their bevearge was on the way once seats were secured. it was a frightening sight as zimmer frames and electric wheelchairs mixed with walking sticks. Matrons sailed down aisles like Spanish galleons under full sail and woe betide anyone who got in their way as they seized their rightful spots near the view. Rona and I wisely stood back and watched, thinking the start of a Sydney Hobart was friendlier. We found a spot, enjoyed a pleasant meal and went to the bar. I must admit I thought that Valentines Day would have been huge here but not so. A very quiet affair that didn't do anything towards celebrate the day. Perhaps it's not a day for Seniors to celebrate. We were going to leave at 5.00 am for the high tide but it was still too dark to navigate the unlit channel. We decided to wait until 14.00 so had breakfast at the pub. We bumped into Steve and Dulcie who joined us for coffee before going back to the boat. Calculations were correct and we got out without too much drama, although the screenshot shows the accuracy of Cmap. We favoured the channel but the plot shows us straight over the rocks. Our next destination is Urangan which is 80 miles away. The forecast is for E/SE winds but as usual the E part was a no show and we motored the entire trip directly into the wind. Rona and I are quite good at night sailing and watch keeping together and the night passed uneventfully. 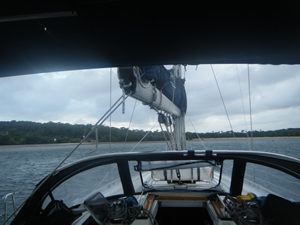 Dawn revealed the coastline and we entered Urangan Harbour at about 10.00am. Our plan was to refuel and then park but that was easier said than done. The harbour was so crowded and because it was a Sunday there were so many boats moving that manoeuvring was a nightmare. We finally found the fuel wharf but found that although it was a floating dock, the piles were outside the concrete rather than in it. Consequently our topsides would hit the concrete piles. We decided to find our berth and sort that particular problem out later. Our allocated berth was one of the most difficult I have ever encountered. It was a blow on berth but at a dogleg angle to everything near it. The berths have very little room between the fingers too so this was going to be tight. We were making our approach when a head poked out of the boat beside us and an American accent asked if we needed a hand. I said we did and got the stern line ready to throw. Unfortunately the American failed to actually make it to our dock, preferring to give me a hand by telling me in an extremely loud American nasal whine what I was doing wrong. ”It’s a blow on berth! He shouted, “You are not gunna make it!” His only concern, and the reason for his offer was to protect his own boat, not to actually be neighbourly. (Now I understand why there is no U in the American neighbor !) . We would have made it easily had he taken the stern line but he just continued to shout in ever increasing decibels “It’s a blow on berth, you are not gunna to make it”. With Rona, thinking the stern was taken care of, she started tending the bow line. The boat stopped midships to the front pile and with the stern still free pivoted so that the bow came around and the stern went towards his boat. I threw the stern line at the American who was now shouting “I told ya that ya wouldn’t make it”. I asked him to secure the stern but he was more intent to embarrass us and stood holding the rope I had thrown, making no attempt to actually secure it. In my best English accent I explained what I wanted in simple international language. “ Secure that f#@cking line”. The mouth on the dock continued to rant, Dreamagic was now side on to her pen and a large tour vessel was coming out of the channel we were in so that we could not move. Ugly American would not shut up, so I asked him, quite politely I thought, where he thought I should go? “I am where I should be” he said and threw the stern line back on Dreamagic before going to the sanctity of his own boat. With what I considered brilliant boat handling skills on our part, we waited for the tour boat to pass, motored out, started our procedure again and backed in without incident. I could see our American friend seething on his boat as he was torn between wanting us to mess it up again and not wanting damage to his boat. No such luck and we tied off and walked to the Marina Office. Another problem that we face is that our new alternator has decided not to play any more. Our batteries are down and although we can charge them with shore power, Rona has meetings in Brisbane on Wednesday and right now we are kicking around the option of leaving early tomorrow and pulling another all nighter to get to Mooloolaba but I am concerned that if our batteries fail we may be stranded. However, having had no sleep for 30 hours, right now what we need is bed. 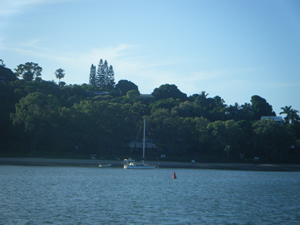 In the late afternoon we went to the Hervey Bay Boat Club. I had been here years ago when delivering Carpe Diem to Cairns. Then we were initially refused entry because I was not wearing socks. (What yachtie wears socks? Well ours do, sir.) This time they have relaxed the rules and entry was easy. The place hadn’t changed though. 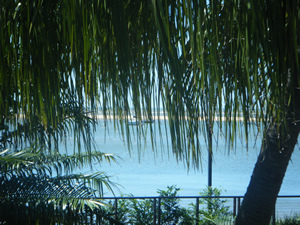 Harvey Bay is predominantly a huge retirement village. He club knows this and caters for it. Meals are unbelievably cheap, and the duo dressed in their black shirts and bright yellow trousers with ties to match play “Spanish Eyes” on a doowack machine while pretending to strum. Meanwhile the patrons put the Tuesday Line Dancing and Thursday Tango lessons they practice to good use on the dance floor. Personally I think it’s great to see but the bit I didn’t get until half way through the second bottle of wine is that these people are not much older than me! I never see myself as nearing retiring. Christ how can I be retiring from something I haven’t started yet! Arose at about 6 and the wind was still fairly strong but after waiting until 8.30 it was showing signs of easing. The weather had improved and its funny how a sunny day always makes things look better so we decided to give it another go. However, before leaving we felt it only fitting to have pancakes for breakfast, this hopefully being our last day in Pacake Creek. Out to sea the waves were flatter and we picked our way carefully through the three marked rocks, Inner, Middle and Outer that guard the Southern entrance to the creek. We also picked our way with a bit more trepidation beside the un named rocks between Inner and Middle Rock that frighten those who don’t zoom in enough on CMap. There is a lesson to be learned there. Out to sea we called VMR Round Hill, told the our intentions and asked for local knowledge of the entrance to Round Hill Creek and the town of 1770. It seems the local knowledge is that our draft at 2 metres is too big for the channel mouth even at high tide. Next stop is Bundaberg, 62 miles away. The wind is still blowing at 20 -25 kts and although the sea is calmer, it is far from flat so we are punching into it at a steady 4.5 kts over the ground. The wind is absolutely on the nose, not even favouring one tack or the other. This is going to be a long day. With little else to do I got Lucas’s Guide out again and reread it. I stared at CMap for a while and read and re read the Queensland Tide Tables. Trying to remember the rule of twelfths, apply the 73% ratio to the high tide at Gladstone, I think we should be able to get in an hour before high tide with about a metre to spare. Rather than push into this for 16 hours we decided to give it a try. Except for a senior moment when I suddenly doubted which side of the lone green that marks the entrance I should pass, unfortunately when we were almost upon it and in the middle of the surf, we made it with about 2.5 metres to spare. The creek got much shallower inside but we finally made it up to 1770 and anchored in a deep water channel just opposite the pub. A short dinghy ride and we were having a cold beer on a sunny day at a beachfront pub overlooking Dreamagic. The people here are unbelievably friendly. As we walked in we met a young couple, Dave and Jane who were sitting by the steps. “You have a great life” Jane opened. We chatted with them for a while. They live in 1770 and own a Tahitian lime farm here. Dave is also the local tree surgeon. We then met the barman, Bruce who has a boat at anchor just in front of ours. Bruce offered to drive us into town when he finished work at 4.00. We didn't need to provision, but it was a nice guesture. We were happily letting the afternoon drift by with these people when a voice muttering about feral yachties was heard behind us. Steve and Dulcie from the SY Monique in Rosslyn Bay walked in! They had driven down for a weekend camping with their son. Bruce finished work and wondered if we wanted to join him and his girlfriend for dinner at the restaurant that evening. We accepted and had a splendid evening, meeting Penny, who is very active in conservation in the area. Bruce never mentioned it until asked but at one time he was actually Englands greatest surfer winning a title. He still surfs and makes surfboards when he is not tending bar. All in all a great day. To anyone who we met who may be reading this, Thank you! We had to leave early because we are tring to catch the high tide out at 5.00am tomorrow, but please get in touch via this blog and when we come back we would love to catch up. We had torrential rain last night although morning produced the promise of blue skies. We readied Dreamagic for sea and waited for the forecast. 20-25 knts South East with 2.2 metre seas, Friday 20-25 easing to 15-20 in the afternoon. Not good, but we decided to try and given that we were on a falling tide decided not to delay. Consequently we were out of the channel and into the sea by 07.30. We called VMR Round hill and told them our intention to make our way to Round Hill Creek. By 09.00 we were back. The sea is very big and with wind on wave it is kicking up a real chop. Dreamagic is slamming down the back of every fifth wave or so and our speed over the ground with engine on and half jib up is less than 3.5 knots. Clearly a trip to Bundaberg, 60 miles away will have to wait. We called VMR Round Hill to inform them we were staying another night at Pancake Creek. Her response was "I thought you might. It takes a couple of days for the seas to die down". We returned to our anchorage, licked our wounds and considered our options. The best course of action would be to wait here until tomorrow late morning, hope the promised easing wind arrives, and then scoot around to Agnes Waters, just 12 miles away. Rona will get internet coverage there so can catch up on her work. The weather is due to abate at the weekend so we can do the two big legs we are facing, Bundaberg and then Urangan in more clement weather. What shall we do now? As typical of the Poms, first thing on the agenda is a cup of tea. A bit of cake wouldn’t go amiss either. Rona fired her laptop thinking that she could get a lot of the emails composed at least and then send them when we had coverage. However, through some freak of atmospheric ultra violet radio wave bounce we have coverage here! Now we don’t. Yes, we do! No we don’t. Rona spent the next three hours sending about a dozen emails on a system reminiscent of 2400 bps baud rate that I, showing my age can remember. It would start with promise, slow down half way through, pick up again where it left off, forget what it was doing and start again or actually finish the job. I am talking about the signal here! I then checked my gmail account at the server level and managed to update the blog for the past three days. At least Willi’s fans now know what is happening. I was worried that there would be calls to the Coast Guard, Channel 7, that sort of thing. I half expected to see David Koch pose the question on Sunrise TV one morning while Willi, who can see him through the frozen digital signal for one second in every six, sits impotent, not being able to tell the teary Housewives of Australia that he is OK. I think perhaps being on the boat too long in close proximity to one other person, to the exclusion of the rest of the world affects the brain. One suffers flights of fancy not experienced when living in the balanced world of Terra Firma. Back to earth, or in our case water, I spent the afternoon getting thrashed at Scrabble before pizza cooked on Mountain Bread, accompanied by a glass of rough red brought the evening to a close. The weather is definitely against us. VMR Forecast today is 20 - 30 knts from the South East. Trying to push south in this would be bad for the boat, hard on us and dangerous. We decided to stay at Pancake Creek and review the situation tomorrow. Our anchorage is just outside the leads into the river here. There has been no traffic whatsoever in or out of the creek for two days. He weather was bright but blustery and remained that way until late afternoon when the rain set in. The wind generator is keeping up with demand, just, so we don’t need to start the engine for electricity. I spent the morning writing, strumming guitar and reading. I also spent some time route planning for our return trip in June. I drafted an email to everyone we know who might be interested in sailing while we are in Brisbane, or who may want to join us for some of the trip north when we leave. Meanwhile, Rona spent the day pottering as she calls it, or faffing about as I refer to it. We now have fresh bread, fresh yoghurt, a fruit cake and a beef stroganoff for this evening. She has also rearranged the lockers in the for’ard head. It’s amazing how the days slip away when you are cruising. The first time we got delayed without communication was at Island Head Creek during TC Anthony’s visit. Then I felt a real frustration at not being able to contact the outside world. This time we are resigned to the fact that we can fix what we can fix, and things we can’t fix need to be left alone. I am sure that this is good for the soul and would recommend it to anyone feeling rushed by the frantic world that we create for ourselves with instant communication and impossible deadlines. Having said that, I know it is difficult for Rona who does need to keep in touch with family, and her business. The weather forecast for tomorrow and Thursday is not looking particularly good. This seems to be our luck at the moment. When we have to spend a day in Port the weather is fine and from the north, when we want to leave it swings to the south and builds. At Mackay we had the same issue. In this instance, tomorrow and Thursday are bringing severe winds from the south to a maximum of 35 knots. Today should be fine until about 17.30 when they are due. We have about 30 miles to cover to the safety of Pancake Creek so the question is whether we sit it out at Gladstone where there is a town or get a days head start and make it to the creek, where there is nothing. We refuelled and decided to go. 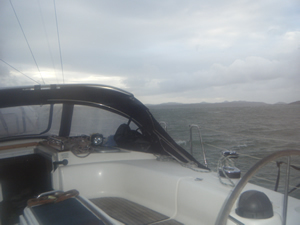 The trip was motoring all the way into a slight sea but strong current and 20 knots apparent wind. None the less it was good to get back out to sea after two days at the marina. Rona tried her hand at splicing a loop into one of our dock lines. The result can be seen here but the main thing is that after an hour of staring, groaning, tip of the tongue between the lips concentrating, she did it! Well done. We got to the mouth of Pancake Creek mid afternoon, just as the sea was beginning to build. The entrance was a little confusing as the attached image shows. A triangle is usually a green mark and left to Starboard, or the right. A square mark is painted red, and left to Port. The entrance to Pancake creek is very shallow and mistakes can be costly so this mark gave us some cause for concern. 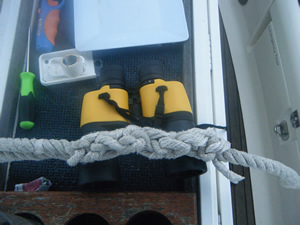 (It is actually a bottom lead as well as a port mark, and the top lead did come into view eventually). We navigated through and anchored in about 6 metres of water, well inside the creek. As the tide dropped we could see sandbanks surrounding us. This isn't in Queensland Guide to Safe boating! A call to VMR Round Hill via VHF found us logged on but with confirming news re the weather. We may be here an extra day but we decided to make that call at the morning sched. We settled down to Hot Dogs and played scrabble until late. The wind was building and there was considerable rain during the night. Another lay day is on the cards. It was a beautiful day so after Rona caught up with her chores we thought we might go into town, get a cup of coffee, perhaps even see a movie. Gladstone is quite a long walk from the marina but there is a bus service right outside. We obtained a timetable and the bus came promptly at 10.45. Two tickets to Gladstone Central seemed to be just the ticket if you excuse the pun, so upon entering the bus that was our request. "I don’t go to Gladstone Central", the bus driver replied. "We only go to Kin Kora Central”. “Great! We’ll go there”. Tickets purchased we sat and enjoyed the scenery as the bus took us through every back street, in down town Gladstone. After about 30 minutes Rona thought she saw Gladstone Central and wanted to get off. I was unsure, and fearful of being stranded in the middle of Gladstone suburbia in the now sweltering heat. We stayed on the bus as it wove its way down streets that were obviously too small for it, convinced that the driver was making up her own route. We were therefore relieved when the bus finally popped out on a main highway opposite a shopping centre! Kin Kora I presume, but the sign said “Welcome to Gladstone Central”. We rang the bell and the driver begrudgingly stopped the bus. As we got off she growled "We don’t call this Gladstone Central, this in Night Owl". Of course it is. We crossed the highway and entered the centre. Outside it was huge, but inside it was dingy and small. Just a Bi-Lo, a small coffee shop, and a hairdressers. the place had been painted a tasteful baby poo brown throughout and a large down escalator took up most of the bentral floor space. Peering into the gloom of this moving belt, it led to the underground carpark. We asked where KFC was, as we had seen the sign outside. That’s down an escalator. Where are the toilets? They are down there too. The Cinemas? They are upstairs. We went down the escalator, found the unlit carpark and walked through to find ourselves back out on the street. We finally found the KFC and ordered. "The Wicked Wings Snack Pack please, but we want an extra piece of chicken”. “So, that’s the Wicked Wings pack with two extra pieces”. "No, one extra piece”. "OK, That’s two Wicked Wings packs”. “No, we want a Wicked Wings pack but it come swith three pieces, and as we are going to share it, we want an extra piece’. “No, it comes with two pieces”. “It says three on your sign”. “What Sign?” “The one above your head”. She stared at this as if we had put it there while she wasn't looking before announcing, “Well, that’s wrong. What I can do is the Wicked Wings Snack Pack, charge you for one extra piece and give you one piece, free of charge”. "That will be fine". From the KFC we found the cinema. We have wanted to see “The Kings Speech” for some time so were delighted to see that it was playing. We queued as the line moved painfully slowly. Two rather large 20 something women were in front of us and each took an age to buy their tickets, a jumbo coke and what looked like a horses feed bag of popcorn. Finally we were at the front of the queue. “Two for Kings Speech, please’. “You have to go next door for those tickets”. Of course we do. We left that queue, went through some more doors into another ticket area that had no one there. “Two tickets for Kings Speech, please”. “Certainly, where would you like to sit?” The attendant showed us a map of the cinema. “Here.” Rona indicated. “Certainly, would you like anything from the menu or the bar?” “Just the tickets”. “Certainly, that will be $60”. “What!!!!! We just want to see the movie”. “You can do that at normal prices at 4.20 this afternoon. Right now it’s $30 a ticket”. We left and hiked back to the boat, not trusting the buses. They are a strange lot up here. Country born and bred. Strong in the body, but soft in the head. I was putting off explaining how the Narrows work until we had actually navigated them. Obviously we have or I would not be writing this! The Narrows is a stretch of water between Curtis Island and the Mainland. Most of it is easily navigable but about 6 miles of it actually dries out at low tide, and part of it dries to a 2 metre sandbank. Normally one would not attempt to take a keel boat over this, but it cuts a day off the trip compared to going around the Island, and of course we will be out of the weather. To navigate The Narrows one has to study Alan Lucas's guide and use the tide. The high tide has to be at least 2 meters deeper then our keel, which is also two metres. So we need at least a 4 metre tide. We also need to time it so that we are going over the shallow bit at exactly the time of the high tide.The consequence of not doing this is that if we get caught, the tide will go out and leave Dreamagic lying on her side 2 meters above the water. Should this happen, it is very important that te next high tide is higher than the previous one so she will float free. If the tide is lower, then she will still be stuck. Easy! Well our highest tide is 3.95 metres at 10.46, and the next high tide is 3.90 metres that evening. Tides from tomorrow then get progressively worse for the next week. This is all not looking good for us, but there is TC Yasi. The after effects of that blow is that there is flooding at the moment and more water than usual. If I am right then we should still have a margin to play with over the shallows. We motored up and sure enough, more than an hour before the top of the tide we came through with at least a metre under us at all times. By lunchtime we were berthed at Gladstone Marina and visited the very famous Gladstone Yacht Club for a bite and celebratory ale. Galdstone has always held a special place in my heart as I have competed in 4 Brisbane to Gladstone yacht races, the last being in 2009 in Dreamagic. This club is the Oasis , the 19th hole and it's always good to finally get here after the trial of the beat from Scarborough. It's like sailing down a country lane! Our plan is to be here for two days so that Rona can catch up on some work. Of course the weather, which has been blowing steadily from the South East for all of this trip is forecast to swing to the North for the next two days, before swinging back south on Tuesday, which is when we leave. How lucky is that! We held court at a window seat overlooking the boat ramp all afternoon. If you are ever in need of cheering up go and find a boat ramp to watch one weekend. this one didn't disappoint as we watched divorces blossom, and friendships fail as people swore, shouted, kicked their boats, trailers and cars as they struggled to get boats on and off the ramp. After such a big night we were not feeling that bright eyed and bushy tailed this morning. We crawled up to the café for tea and toast, filled our water tanks and put 40 litres of fuel from our jerries into the tank before untying and setting off. On the way we managed to bump into several people we had met and said our goodbyes one more time. People seem incredulous that we are actually going. They ask in amazement “You are actually leaving? What, today?” Although they are cruising yachties, most have been here years. Rosie has been here three years, the old fellow with the dog has been here six. All very Hotel California. You can check out any time you like, but you can never leave”. 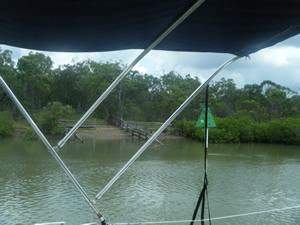 We got out of the marina and set a course for the mouth of the Fitzroy River, some 25 miles away. The wind was actually blowing an Easterly so we could set sails but we, or more accurately I was that lethargic I could not be bothered. 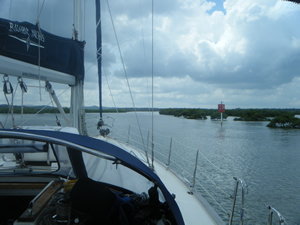 Kepple bay is wide and shallow so the sea was flat but with an awkward slop from amidships. The Autopilot, sensing it might actually be relied upon to do something useful decided to read about 80 degrees from where we were headed. This autopilot does that sometimes when it has just been switched on but usually settles down after a cup of coffee or whatever. Today it decided not to. God, I hate it when inanimate objects get moody. We hand steered 42 miles to cover the 25 miles we had to go. (Don’t ask, OK?) closing on Curtis Island and the entrance to the river. This is a very wide, very sand banked area which funnels water in and out of a narrow channel, interestingly called “The Narrows”. Navigating through The Narrows will save us a day going around Curtis Island to Gladstone. However in the middle of The Narrows is a sandbank which actually dries until it is sticking 2 meters out of the water at low tide. This is called “The Cattle Crossing” because at low tide, well you can guess the rest. It should also be called the Yacht Trap because it has caught many a yachtie unawares and left their boat high and dry. The key is to be at the very top of the sandbank at the very top of the tide. That is 5 miles down the river so if the boat does 5 knots we should leave an hour before to make sure we are there at the right time. The tide has to be 2 metres plus our draw which is 2 meters so 4 or better. Multiply that by the tidal range difference mean average between Gladstone and Rosslyn Bay, factor the tide difference between Rosslyn Bay as a major port and Curtis Island as a minor one, add Ronas’ age in whole years to the length of Dreamagic in feet, divide by the number of glasses of red I drank last night and we should be leaving here at 03.38 in reverse at a steady 16 knots but certainly no less then 12 to make a safe passage. I may revisit these calculations in the morning. We anchored in a wide channel opposite Mosquito Creek and had a beautiful dinner of Tandoori Chicken washed down with water. (Yes that’s right. It’s a designated AFD or Alcohol Free day. And there is no one here to buy my drinks as happens on most Alcohol Free Days.) An Early night for Rona, I sat and watched Heartbeat on TV and amused myself spotting Ford Anglias and Austin Healy Frog Eyed Sprites until the mosquitoes decided it was time for dinner and made the 300 metre flight to find some. Mosquitoes at Mosquito Creek. Who would have guessed that? The day broke sunny and clear so we walked to around the headland to the service station and had a cold drink and read the papers. Having completed the repairs to Dreamagic we spent a while putting everything away and cleaning up before catching the bus into Yeppoon. We went specifically to buy a mop and have a final lunch. 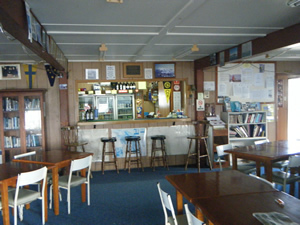 The mop was easily found and lunch was to be the Kepple Bay Sailing Club. It has tobe said that the Kepple Bay Sailing Club has done quite well. On one side of the street is a huge building which is right on the beach. it houses a restauarnt, several bars and great views. on the other side of the street, directly opposite is another equally large building which houses the gaming machines, another restaurant and more bars. These facilities are on the most impressive pieces of real estate in Yeppoon and must be worth millions. Perhaps it was the effect of the past few days, the cycone, the fire, the weather, but one bottle of wine turned into two, which then made three seem like a really good idea. We could not catch a bus, the broom was not an alternate means of transport for Rona despite what one patron of the Club said, and we finally summonsed a cab to take us back to our farewell party at the Capricornia Sailing Club. We met with Steve and Dulcie, Mitch and Meg, Rosie and Tommy and enjoyed a BBQ and yet more alcohol. Back to our boat for some very suspect home brewed Baileys before saying our goodbyes and falling into bed. Rosslyn Bay has to be the friendliest yacht club and marina I have ever been in. The residents are fantastic and it is very hard to say good bye. One thing that is for sure, we will be back on our journey North. Day 23 Then there was light. We woke up to no power on the boat. Consequentally we could not get news of what had happened when TC Yasi had crossed the coast. Gradually, through mobile phone, sms and internet we got a picture of a very relieved Cairns that had missed the worst of the storm. Not so lucky, Innisfail and Cardwell. 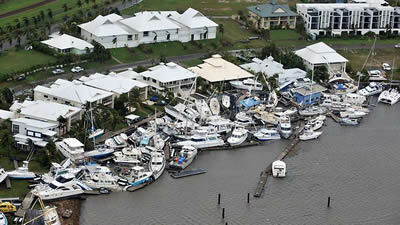 Port Hinchinbrook, where we were only two weeks ago had been destroyed. While Richard shot off to volunteer for the SES we surveyed the damage to Dreamagic. The fire had licked the corner of one of the batteries and the insulation had melted on some of the smaller wires. Of more concern I had turned the battery kill switch off when the fire first started and that could not be turned back on. Consequentally we had no power to anything on the boat. The fridge and freezer were of most concern as they were thawing with our provisions for the next leg of the journey. Richard came back at about 10.30 and we started to strip the electrical system. The switch is sited beneath the navigation table and defied all logical ways to get it apart. Bloody Germans! Finally we had to work one handed through a small aperture at arms length on a switch that was wood screwed to the inside of an inaccessible panel. Well done Richard for your patience with this. Having finally got the switch out it was apparent that the amperage going across the switch had welded it shut. I suppose we were lucky that the fire hadn't started there as it would have been difficult to access. The next problem was to obtain another switch but that turned out to be a stock item at the local chandlers. Once fitted we connected the alternator and a test showed all was working well. We have lights! In the afternoon Rona managed to get the courtesy car yet again and went to secure some torch batteries. Because of the recent floods here, followed by the threat of Cyclone Yasi these proved quite elusive but finally we got enough spares. In the evening we wandered over to the Capricornia Yacht Club for aperitifs before returning to Dreamagic for a dinner of fresh prawns. We were now getting images of Yasi and Cairns was very lucky.All the friends we spoke to were fine and humour was creeping back into some of the messages and texts. We do know people with holiday homes in Mission Beach and Tully. These areas were badly hit and we don't know what has happened there. With everything that has been going on we were unbelievably tired and an early night was definately called for. Day 22 Grossly Over Charged! We spent most of today watching the TV coverage of TC Tasi. Initially Cairns was in the path of the storm but as the day wore on the cyclone turned slightly south and would cross between Innisfail and Cardwell, about 100 kilometres south. Bad news for those communities but the population density isn't so great. so good news for Cairns. We were constantly on the phone and email to friends and heard that the Hammonds had been evacuated form Yorkeys Knob. We spoke with friends who owned boats in the marina and they were very pessimistic about their chances. Warwick from Shaka Zulu had his boat in the river at Port Douglas and his email updates were paricularly distressing. We collected the replacement alternator and came back to Dreamagic. We also picked up the current copy of Cruising Helmsman and they had published a two page article of mine, complete with a picture of me sitting at Kamatal! Unfortunately they had included someone elses photo in the authors bio but hey! It can't be all perfect. Richard Winter, and old friend of mine living in Rockhampton joined us after lunch and we put the alternator in, tested it, found it didn't work before retiring to the Yacht Club to ponder the problem and drink some wine. Richard called some friends of his and we think we have the problem sorted. The field wire is probably on the wrong terminal. A simple fix so more wine, dinner and back to the boat. We had invited him to stay on the Dreamagic so driving, and responsible alcohol intake were not an issue. Once back at the boat Richard, who wanetd to get away early on the following day suggested that we sort the alernator out there and then. Attaching the positive to the terminal he accidentally shorted it to the earthed body of the alternator. The wire immediately became too hot to undo, and the battery bank caught fire! Fortunately we had a fire blanket handy so we killed the batteries and put the fire out. However the kill switch may have melted as we could not turn the power back on and had to go to bed with no 12 volt electrics. Not the most successful day. TC Tasi is looking very menacing and the news ay that it is the biggest cyclon eto have ever hit the Queensland Coast. A Category 5 it should make landfall tomorrow night. We have decided to stay in Rosslyn Bay until it is over. We have an alternator problem so I spent the moring calling every auto electician in Rockhampton to try to get someone to come here. In all over a dozen, not one had the time to look at the boat. finally I took the alternator off myself. It's a standard Bosche and realsitically I new one would be cheaper than trying to get this one fixed so we went to Repco and the replacement will be here tomorrow. Rosslyn Bay have a courtesy car that they will lend guests free of charge. We used this to go into Yeppoon for provisions and then walked over to the yacht Club for dinner. Dinner is a very DIY affair. They sell you a pack of 4 sausages for $6.00, you cook them yourself on their BBQ and then have them with bread and onions. After last nights dinner it seemed an excellent idea. We were introduced to Steve and Dulce ex SY Farrgo Express and now from SY Monique and Meg and Mitch from SY Arjuna. We spent the eving in their company telling sailing stories and keeping up with the news as the horror of Cyclone Tasi unfolded. Do I stay or do I go? In this instance our choices are simple, but with big consequences either way. There should be a window of NE wind about lunchtime, but it will swing to the South East and strengthen later in the evening. Yeppoon is 60 miles away or about 8 hours with the wind behind us, 10 hours with the wind ahead. If we go, then we face bad weather near Yeppoon. Staying looks the option but the weather forecast is then to deteriorate, and as an added complication,TC Yazi is in the Coral Sea. We don’t know much about this one except that it is near Vanuatu at the moment and it’s big. If we stay we are up this creek for another four days and I really don’t want to weather a cyclone in the middle of a lake. The morning started with rain showers but less wind than forecast so we decided to go for it. 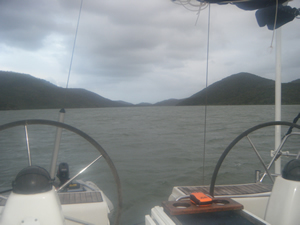 We crept past the Island Head rocks again and out to sea where we set a half headsail and motor sailed towards Yeppoon. For once the Wind God smiled on us and although the forecast North Easter never appeared, it was just off the bow which meant that three tacks got us to within 10 miles before the heavens opened and visibility came down to less then 100 metres. We found the break in the marina sea wall and found our allocated 13 metre berth. This was without the shortest 13 metre berth Dreamagic has ever been squeezed into but we got the first three quarters of the boat in before we ran out of concrete. With our backside hanging out, (but in line with all the other boats), we closed her up, stepped onto dry land for the first time in 6 days and went to the Yacht Club for a well deserved beer! 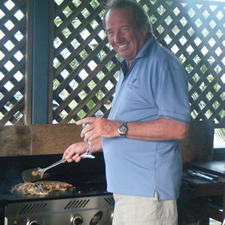 Capricornia Yacht Club is one of my favourite clubs on the East Coast. It is really small and intimate with the focus on sailing, a rarity in these days of a Clubs main focus being to make profit often at the expense of providing a service to those members who pursue the activity for which the club was founded. However, although it has only 300 members, there are plans on the wall to knock it down and build a two story structure with a function room, restaurant, etc. Ah, well. We had a couple of drinks there and watched the news. TC Yazi is huge! 1000 kms wide, more destructive than Katrina that flattened Darwin, and on her way. Leaving Island Head was a good call. Day 19 Are we having fun yet? It’s funny how things always look better in the light of day. Well perhaps not everything, some things definitely improve under the cover of low light but you know what I mean. Until now, despite the wind we have had sunny days which always make everything look bright, but at night there is just blackness. Visibility is limited to no more than 20 metres and all one can see is the whitecaps of waves rushing past as they break over the sandbars beside us. The wind screams like harridans as it pulls at the rigging, trying to lure Dreamagic against her anchor onto the shore. I actually love this stuff, the concerns I have now are real and the decisions made have a visible and immediate effect. This is so unlike when I was a “General Manager” and Outcomes, Cash flows, Budgets , and Key Result Areas would keep me awake at night. I am so impressed with the way Rona is handling it all though. She must be feeling nervous. Sailing is all 15 knots, sunny days, off the breeze with a Gin and Tonic isn’t it? However she is smiling constantly and there is no hint of concern. 06.30 We have just received the first weather forecast for today. TC Anthony is moving toward the coast and should cross tonight. At the moment it is heading for just north of the Whitsundays which is not bad for us, but worrying for the charter fleet. (Obviously our imaginary friend is bigger than theirs). I can imagine what is happening on board those boats now racing for shelter in wild weather with weekend skippers and families as crew though. “I told you we should have gone skiing, but no, you had to play Jessica Watson”. Our immediate decision is whether to move or stay put. This is not the greatest anchorage as there is no swing room. We are alright in a South to South Easter but if the wind swings we could be on a bank. There is better mooring further up the inlet but the argument against is that we have weathered two tides here in winds to 38 knts without a moments worry, the new anchorage may not hold as well a this one, and the channel is ill defined, especially in this weather. We have 80m metres of chain out (Fortunately I added another 30 to the 50 the boat is equipped with before the Louisiades Rally. It makes the bow heavy for WAGS, but I am bloody glad I have it now!) So the decision is stay. 08.00 Our friendly VMR Thirsty Sound has issued Cyclone Warning #9 which takes the costal communities between St Lawrence and Lucinda off cyclone alert. We don’t understand this as TC Anthony has to go somewhere so if the are off alert, who is on? A call to VMR only got the response “Good Question, hopefully the next bulletin may clarify”. If it’s moved, I hope our imaginary friend has moved it the right way. It’s interesting to think that up and down the coast people are praying that their God save them from this tempest, presumably to hit someone else instead. Not unlike the recent floods in Brisbane when people thanked God that their home was spared. Aren’t all these weather patterns Acts of God? Certainly that is the opinion of the Insurance companies. 08.30 Wind blowing at a steady 27 knts South. The HF High Seas forecast shows that TC Anthony has moved northward and if my plots are correct will cross the coast near Townsville. It is still a long way off and anything can happen, including my plotting being way off but it is some comfort. 14.00. Low tide and we have about 5 metres under us which is comforting. This tide is lower than previous and the sand bars around us are more clearly defined. The wind is still blowing at about 30 knts but the promised rain has so far stayed away. Between our HF and VHF radios we are getting forecasts very half hour. C Anthony appears to have headed north and will cross the coast tonight between Bowen and Townsville. The Whitsundays look spared ths time which is undoubtedly a relief to the Charterers. It’s still blowing hard though and they’ll certainly have some stories to tell when they get home. We are spending our time playing scrabble, cooking and eating, and watching the weather. So far so good! 17.00 TC Anthony is almost definitely going to be north of us, the current trajectory is just south of Townville. Good news for us, I just feel for the guys up there. Although the forecast here is for horrendous winds at the moment we have about 25 knts and the sea has abated. If it wasn’t so overcast and drizzley it could be quite nice. I have to mention the VMR here. I am a member of the Volunteer Coast Guard but I never appreciated what a great job they do. We are the only boat logged on with VMR Thirsty Sound, in fact I think we are the only yacht at sea at the moment. VMR Thirsty sound is our only contact with the outside world right now. Every hour he comes on and broadcasts the news which is progressively worse. Every second time we call him and he is always cheerful even though he knows we are concerned as to what may happen. He has been on the radio now since 6.00am and he is still with us. And he is a volunteer! Probably bad radio etiquette but I will try to get his name tomorrow and write to his organisation. Without that voice on the radio we would be alone here with no way of knowing what is happening. 19.00 His name is Alf Nord. On our last sched I did thank him for his help and tried to explain that he may not appreciate what a valuable job he is doing. He seemed genuinely embarrassed, but then I suppose we are on public radio! In these days when we take instant access to people for granted. When SMS or email needs to be answered immediately it’s difficult to cope when the facility is taken away. Not for us, we know where we are, but for friends trying to contact us. I remember when I was a teenager. If I met a girl I would write to her. Send it perhaps Monday, she would receive it Tuesday, read it, consider a response and I may get a letter back Friday. (In my case often those replies appeared to be lost in the mail but you know what I mean. The anticipation I felt for the whole week was fantastic. Whether I got an answer or not, the uncertainty was electric. Now, kids send an email and if the response isn’t back within ten minutes the relationship is over. I think they miss something. Dinner was chicken sate followed by freshly cooked apple crumble. Not bad for a cyclone! We sat in the cockpit looking at day fade over the cloud wreathed hills around us. The day is very grey but it isn’t raining. Loreena McKennett’s ble nd of Celtic and Middle Eastern music seemed majestic enough for the occasion. We went to bed early because if the weather window we want does open tomorrow, we will possibly need to pull an all nighter to get to Yeppoon and civilisation. Day 17 The Trouble with Ex’s. Day 16 Thirsty? Bloody Dry!